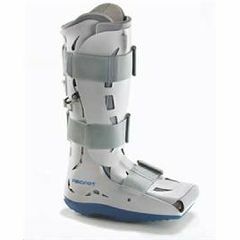 The Aircast XP Diabetic Walker is an alternative to total contact casting for high risk diabetic patient. Walker's shell/aircell and rocker sole maximizes plantar offloading, regulates shear stress and offers protection and immobilization. Includes dual density insole, stockings and hand bulb with pressure gauge to measure individual aircell compression.